“Custom” means a lot of different things in the bike world. In my career as a framebuilder, I’ve never built two identical bikes. Each one is the result of conversations with and studies of the future owner. The results are as different as the people they are for, all with a common thread: me. Every bike I build involves lots of planning, calculating, and reflection; but once in awhile one comes along that requires a little extra. 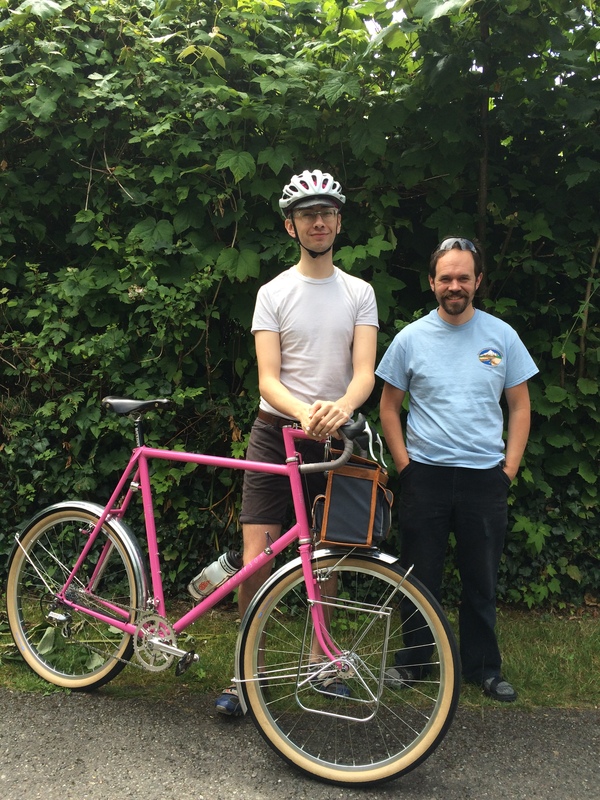 In this case, I was lucky enough to work with Chris and make him the first bike he’s ever had that really fits. We spent a lot of time playing with my Serotta fit bike and talking about things like crank length. I spent a lot of time on my own sourcing tubes the right diameter that were long enough to do what I had in mind. It was fantastic to see the grin on his face the first time he rode it! Schmidt SL “connectorless” hub, SL dropouts made by Hahn Rossman, full custom lowrider rack, Columbus “randonneur” fork blades. 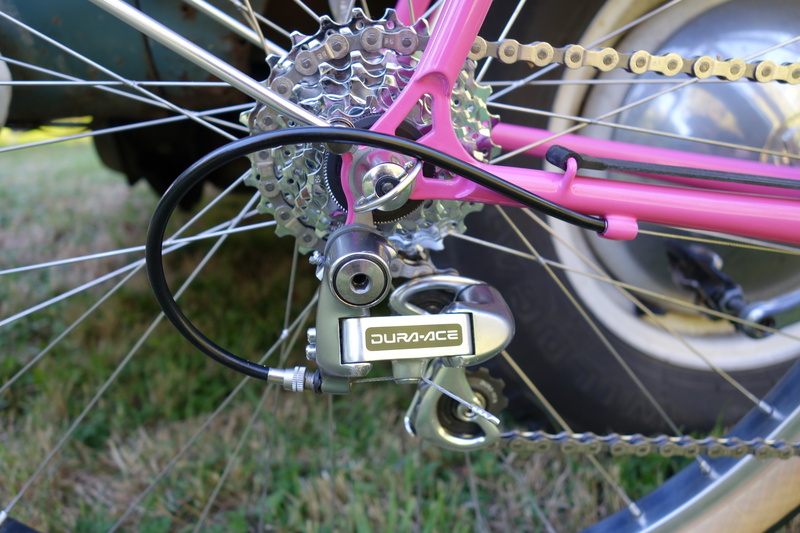 Vintage 8-speed Dura Ace, MAP Bicycles dropouts. Custom threadless stem with bell mount and Hahn Rossman rotary light switch, decaleur, front rack. New Bike Day!!! Happy rider, and happy short fat builder 😉 Photo Credit: Ilsina Nazarova. The bike itself is an interesting blend of traditional and modern. Sometimes folks who don’t really understand what I do accuse me of being a luddite, or falling into a nostalgia trap where things best forgotten are romanticized. It’s not really true, I just happen to think a lot of the old ways really were better. Susan doesn’t see the world that way, but, to my delight, she ordered a bike from me anyway. This left me with the interesting challenge of building a machine for someone who likes all things modern, yet still holding onto the bits of the past that really were better. I came up with a bike that still has a steel frame and fork, fat 650B tires, aluminum fenders, a front bag supported by a small custom rack, and a dynamo powered front and rear light set; but also a Shimano Di2 drivetrain, a USB charing port, and tubeless tires, all seamlessly integrated. She’s only had the bike for a few weeks and it already has over 1000 miles on it. 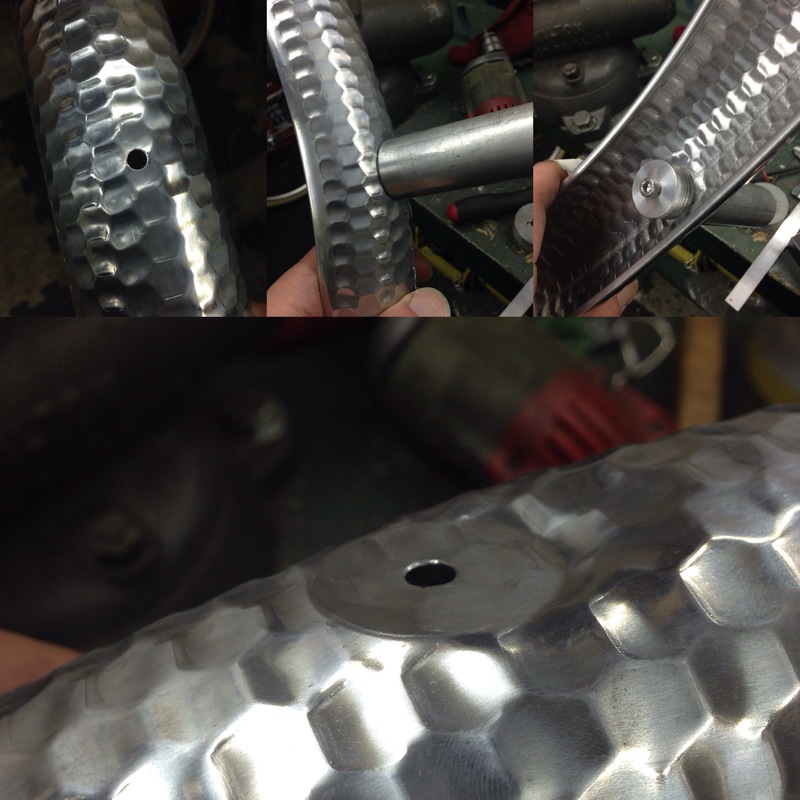 Here are some process photos, and one of the completed bike. Enjoy! 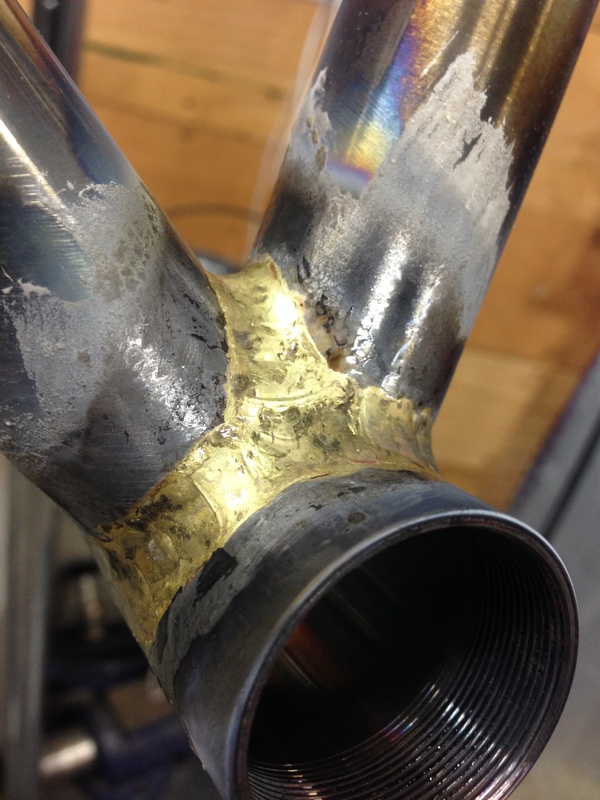 Seat tube reinforcing sleeve is brazed on, top tube is mitered to fit. 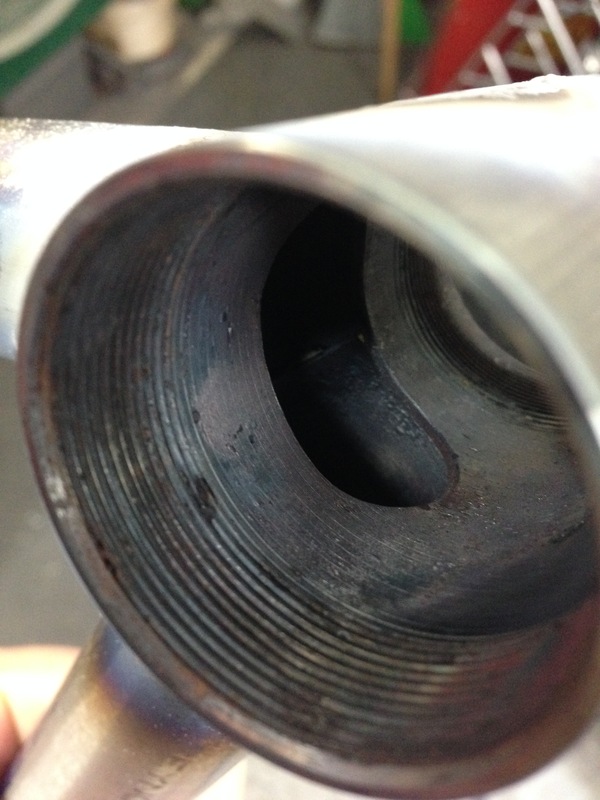 Looking at the cutout on the inside of the seat tube/down tube joint. 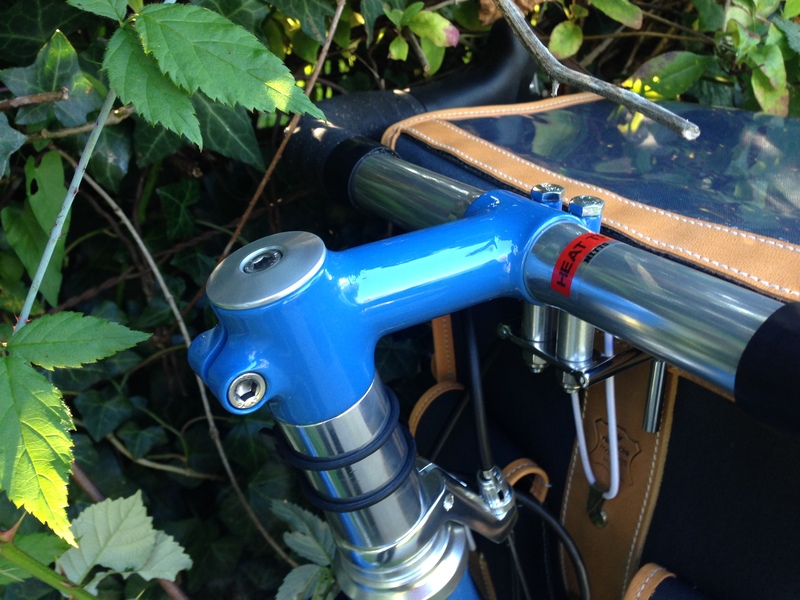 This was done so that the Di2 junction box and associated wiring could be hidden and protected inside the frame. Driveside rear dropout and chainstay, showing exit port for rear derailleur Di2 wire. 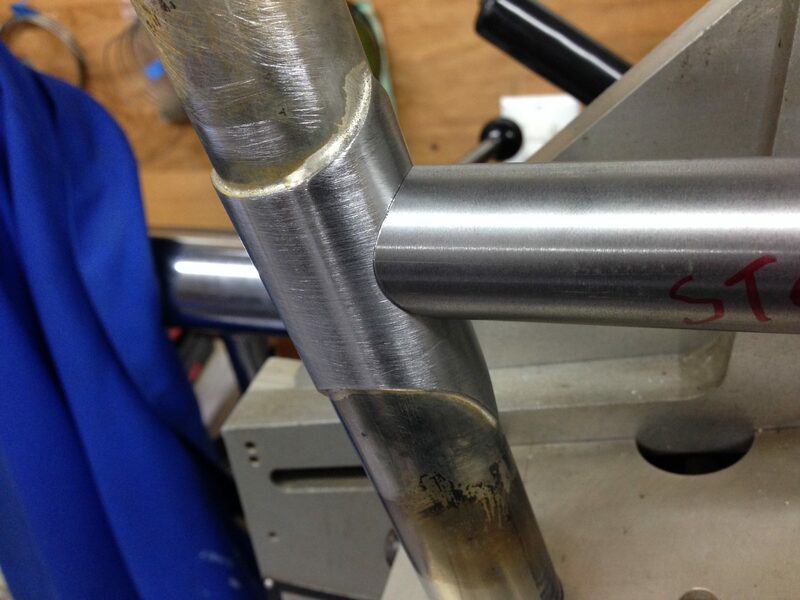 Finished fillets at the head tube/top tube/down tube joint. 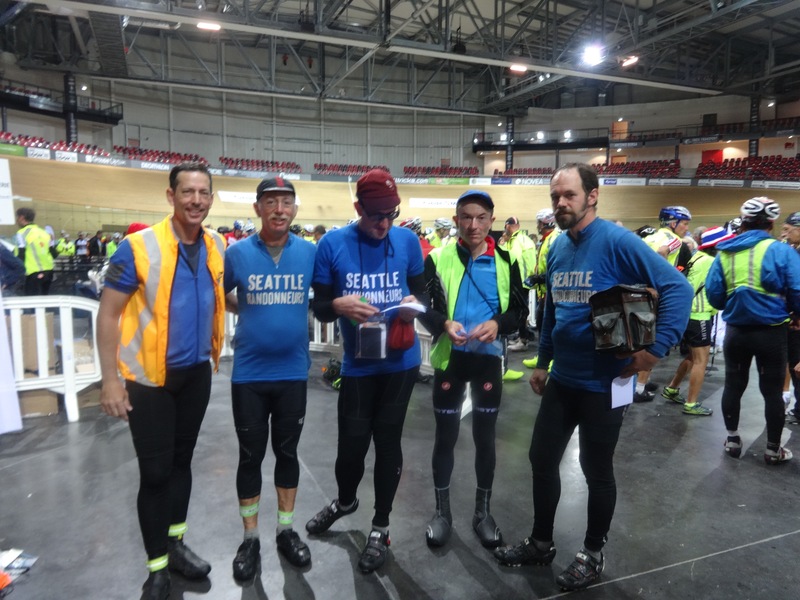 Noel is a very accomplished randonneur from Seattle. He owns a few nice bikes, including a nice 650B bike that he got several years ago, so I was flattered when he asked me to make him another one. He had a pretty clear idea in mind of what he was after, and since I’ve ridden a lot of miles with him I also had some ideas about what I thought would work well. 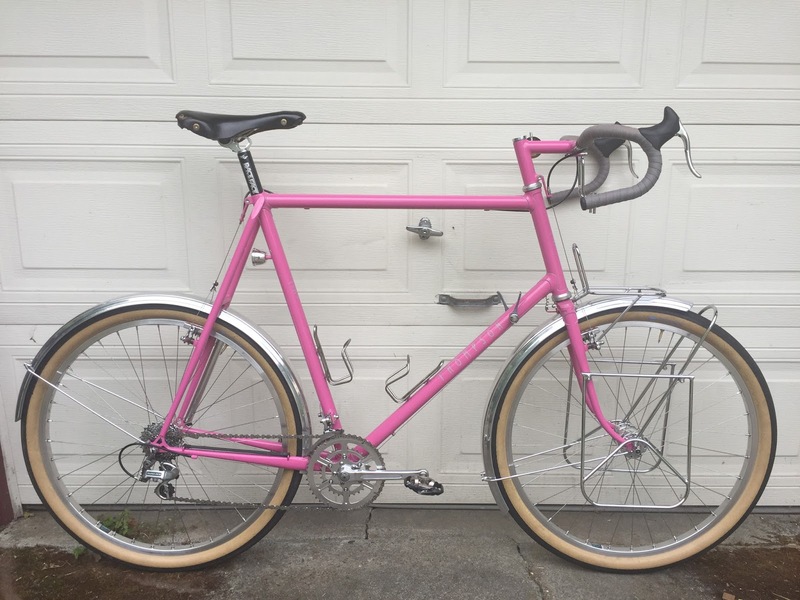 The bike has many of the usual details appreciated by randonneurs- a dynamo lighting system powered by a Schmidt hub with automatic connectors, lightweight tubeless 650bx42 tires, aluminum fenders, removeable lowrider racks for weekend trips…the only real surprise was the color! I had expected something a little more subdued and would not have chosen the bright green, but I really like it. Great choice Noel, see you on the road! 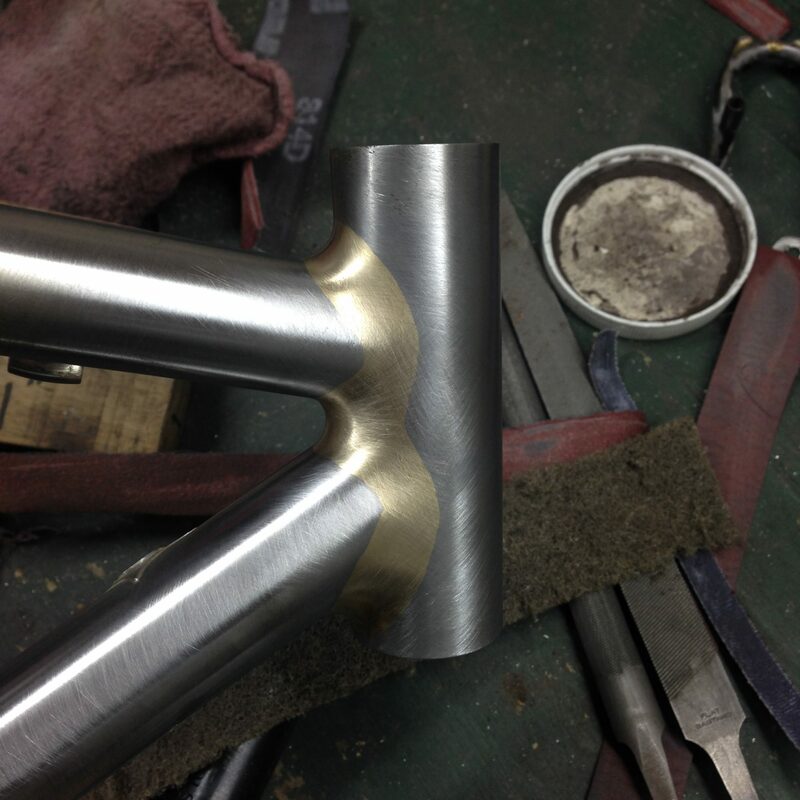 Making the indent where the fender attaches under the fork crown, just one of the many small details in a proper aluminum fender installation. Top end of Lezyne pump, Compass brake. I make a special modification to these pumps to allow mounting between pegs instead of with the awful clip they come with. Bottom end of Lezyne pump, MAP dropout. JM got his new bike a few weeks ago and I’ve been meaning to share some photos of it. First a couple from during the construction, and then a few of the finished bike. Click on any of the images to see them full size. 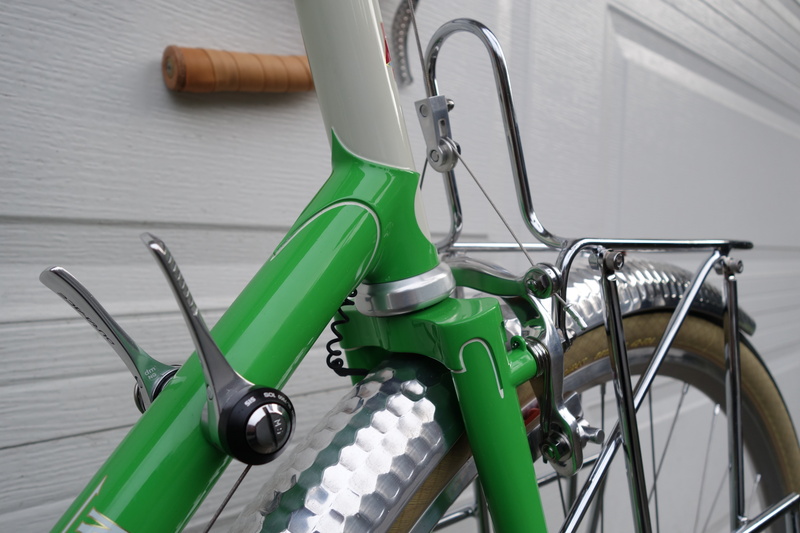 Detail of seat stay caps and seat tube-top tube lug. 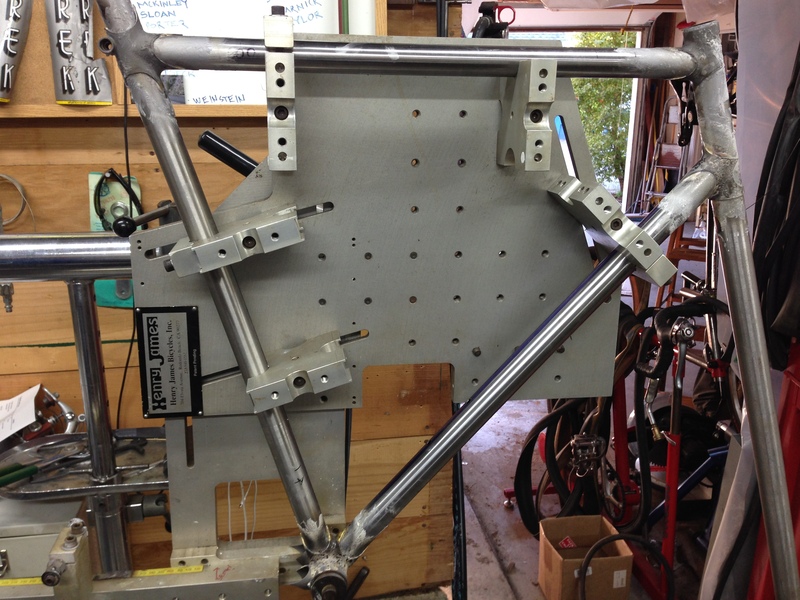 The slot for the seat binder has not been cut yet. Inside face of the left rear dropout. 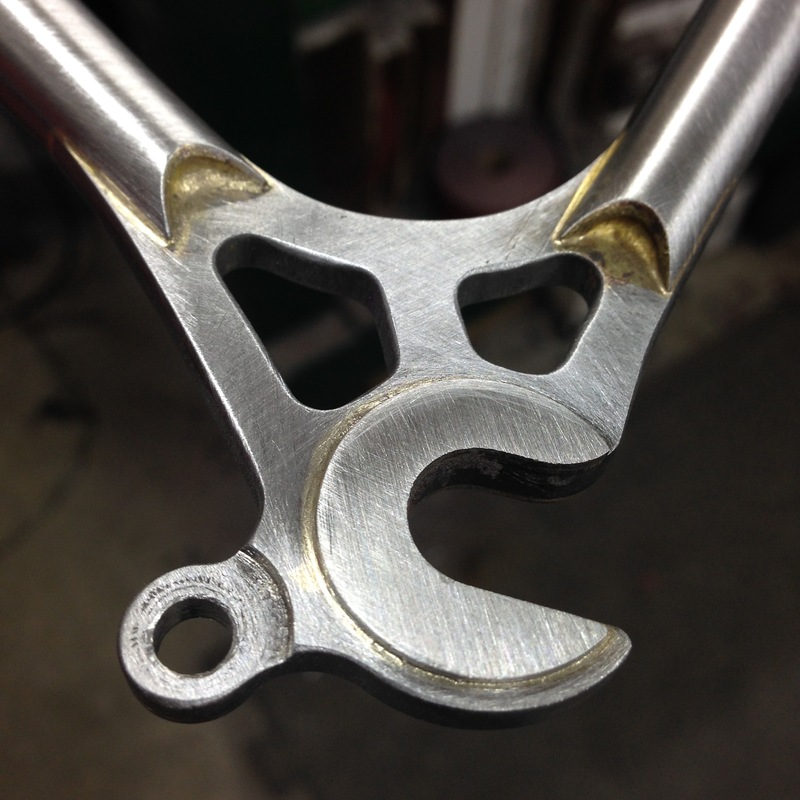 I get the dropouts from Mitch Pryor of MAP bicycles. 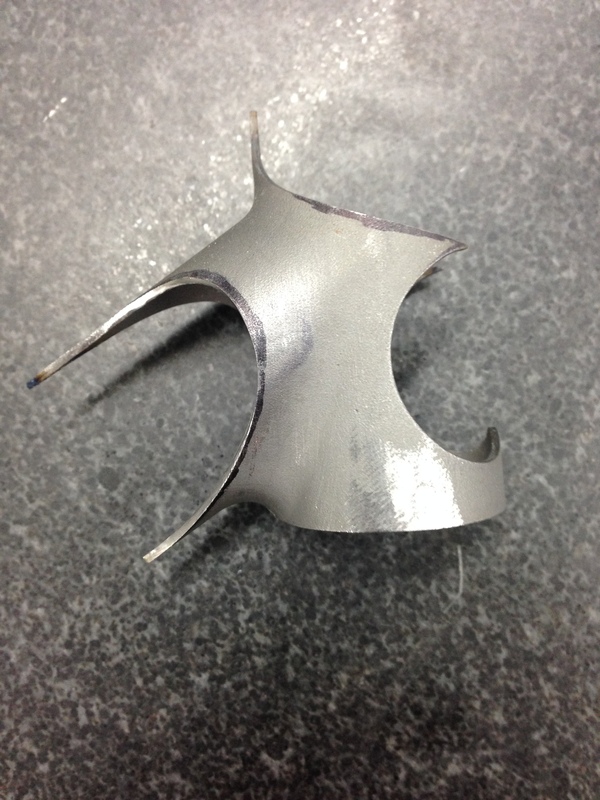 They’re made from chromoly and come with stainless steel faces which are silver soldered on. I modify the eyelet by thinning it and removing the threads so that the fender can be mounted with a drawbolt instead of a P-clip. This is the right front dropout. 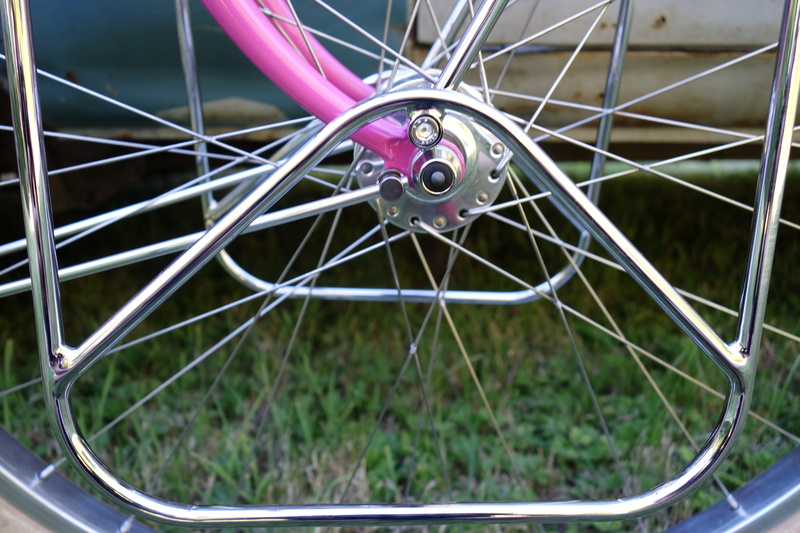 The lowrider rack attaches to the upper eyelet, and the fender stay attaches to the lower eyelet with a drawbolt. The generator hub also makes its ground contact with this dropout while the left one has an insulated insert to make the positive connection. 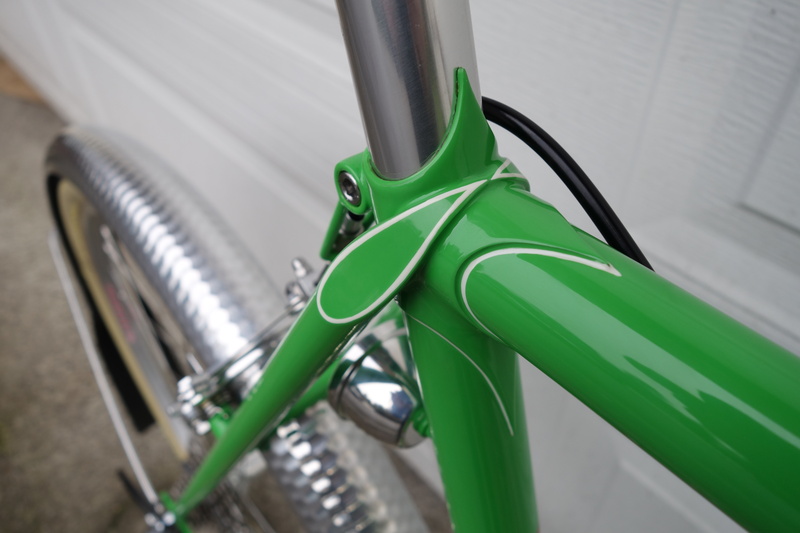 Custom stem to match the frame and fork. The completed bike, ready for its first test ride! When delivery day came, the owner’s wife drove him to my shop. He rode the bike home and a couple days later I got an email telling me he had gone out for a 100km ride after work. I hope he’s as happy with it as I am! 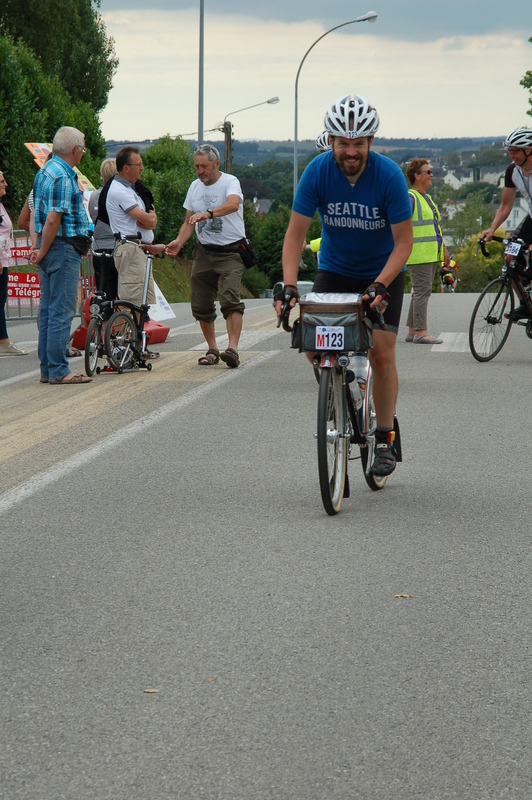 In August I was lucky enough to participate in the famous Paris-Brest-Paris cycling event for the second time. Many people have written about their experiences and described the beauty of the French countryside, the support from the populace, the crowds of spectators, etc, etc, etc. It’s all true. The event is incredible in every way. I had a fair idea of what to expect this time, having participated in 2011 also. My training was adequate, and, by the day before the start, I knew the weather was going to be perfect. In short, I was really able to focus on simply enjoying the ride. I had the opportunity over the nearly 90 hours I was on the course to talk with hundreds of participants and spectators. Mostly French, since the ride is in France and I speak the language, but folks from all over the world too. Ireland, Brazil, Italy, Great Britain, Spain, India, Belgium, Denmark, The Netherlands, Germany, the USA… and many others of course. Those are simply the faces that I recall right now. In most cases, we talked about how the ride was going, sometimes about their bike if they had something I thought was really nice, or about my bike if they liked it. We all agreed though, if the subject arose, that the most special thing about PBP, the thing that makes one want to do the ride again, the thing that makes you laugh, cry, think, is the people. Both the spectators, and the participants. That’s what makes PBP different from any other grande randonee. I can do a 1200km ride with beautiful scenery right here at home in Washington state, or in dozens of other places around the country and world. On all of those rides though, I will spend a significant amount of time alone. Nothing wrong with that, I enjoy it quite a bit. PBP is the 1200 where you are never alone. I offer my heartfelt thanks to each and every one of the thousands who make PBP so special. Since the event only happens every four years, there is lots of time for me to write separate posts about certain segments of the ride, or my preparation, or whatever. Stay tuned for those stories, and enjoy a few photos right now. Look at my previous post from August 8th. Why yes, they did take my picture in front of the same church four years later! 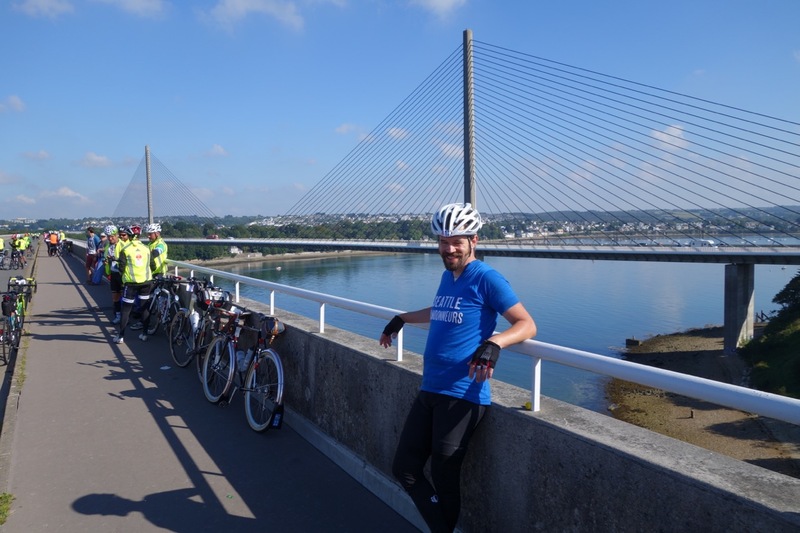 I think it’s in the rules somewhere: one must stop for a photo on the bridge just before arriving in Brest. With Andy and Mike, enjoying the view at Le Roc Trévézel on the return leg. 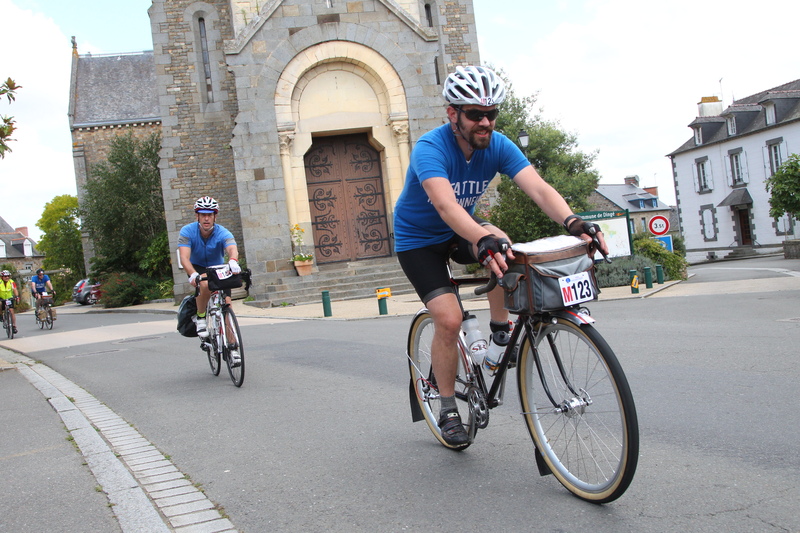 Leaving the controle at Carhaix on the return leg. Not looking too bad considering I’ve already covered 698km. Photo credit: Gérard Pichouron. At the finish. Left to right, Mike, Andy, Jeff, and Olivier. Wonderful riding buddies! Photo credit: Michael Huston. It’s hard to believe four years have passed since I did Paris-Brest-Paris. I’ll be getting on an airplane tomorrow to go and do it again. Of course, that’s not the only reason to go to France, I’ll be seeing old friends, making new ones, enjoying some leisurely rides and fine meals, etc. After the event, I’ll be recovering in Amsterdam for a week. Obviously, Thompson Custom Bicycles will be closed during this period. It will re-open for business as usual on September 1st. My email access will be sporadic while I’m gone, and I won’t be answering the phone at all. If you want to follow my progress during the ride, that should be possible here, once the ride starts. Here’s a photo from 2011. From time to time I’m asked about off the shelf options for 650B bikes. A lot of people have heard about the advantages that larger section tires can offer, but aren’t ready to take the plunge and invest in a custom bike. 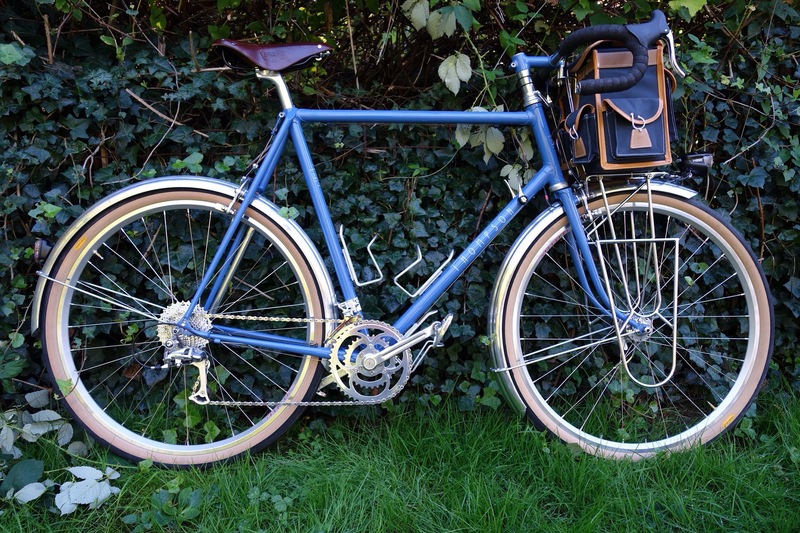 A few good options are on the market now from Velo-Orange, Soma, Boulder, and La Confrérie des 650 for example. I’ve assembled a few and their owners are very pleased. There’s also another option: conversions. Many bikes that were built for 700C or 27inch wheels can be made to work with 650B. Often this means a bike that was no longer being ridden, perhaps even on the way to a landfill, will see many more miles of use. Of course not every bike is a good candidate for conversion, a poorly done conversion looks cobbled together and may not work very well. Sometimes though, it’s just a question of making a few frame modifications so that the end result is a bike that has as few compromises as possible. A couple years ago a fellow cycling club member brought me an old Trek he had recently purchased. I don’t recall how much he paid, certainly less than two hundred dollars. He also brought a box full of components that had been removed from an early 90s vintage mountain bike. 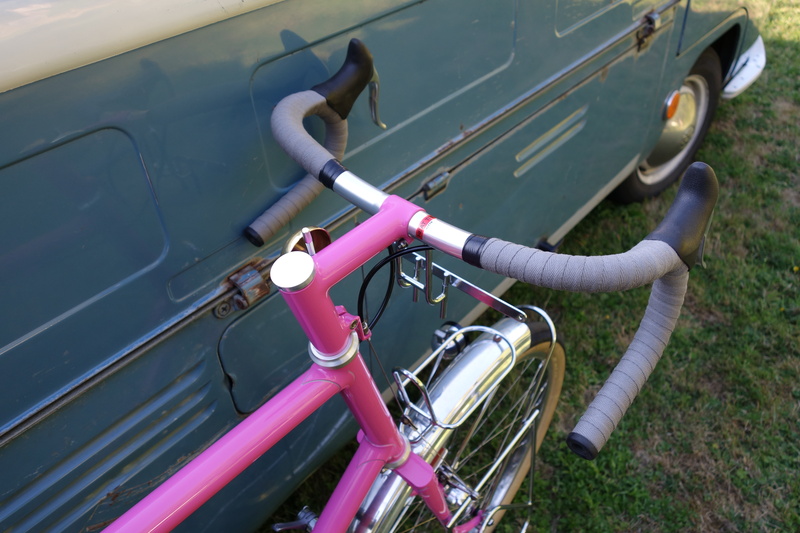 The Trek frame was in good shape, and its dimensions were correct in terms of fitting the rider. I installed a pair of 650B wheels with 42mm tires. 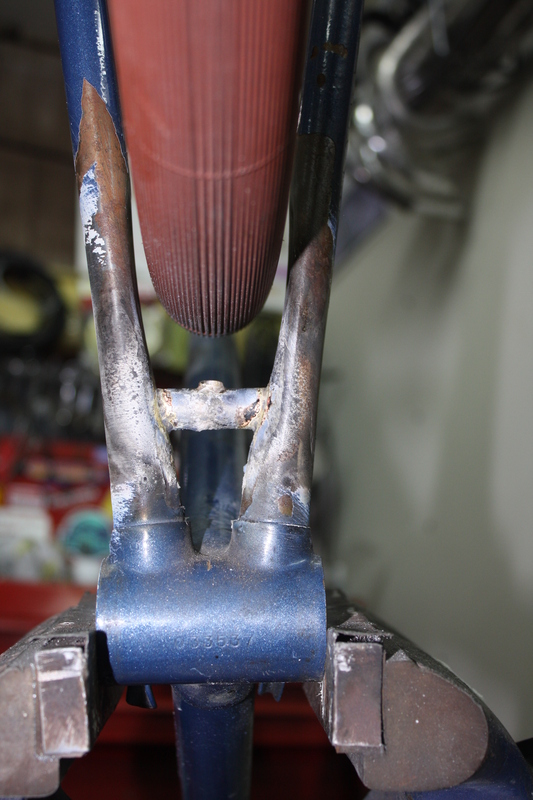 The distance from the top of the tire to the underside of the fork crown looked good. The tire cleared the fork side to side as well, not by as much as it would on one of my custom forks, but adequate. 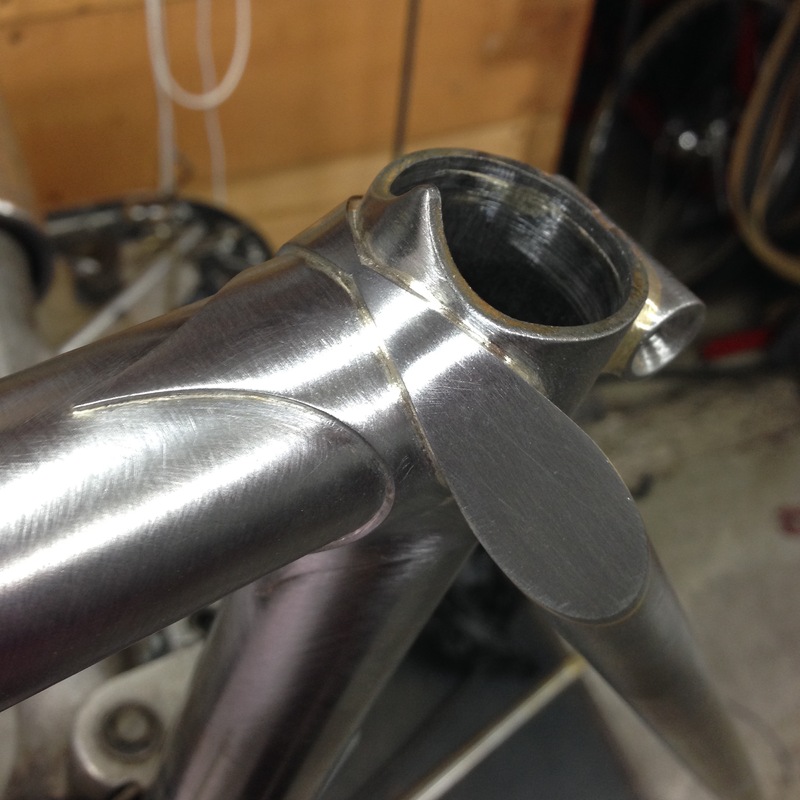 The bottom bracket height was a few millimeters lower than stock, but again, acceptable. Things weren’t so easy when it came to the rear wheel. Even with the wheel pulled all the way back in the dropouts, the tire still lightly touched both chainstays yet it was much too far from the chainstay bridge for correct fender placement. A poor conversion could have been done simply by using smaller tires, but we wanted this one to be right. After I completely disassembled the bike, I removed both the chainstay and seatstay bridge, and spread the rear dropouts to 135mm to fit the hub provided by the customer. 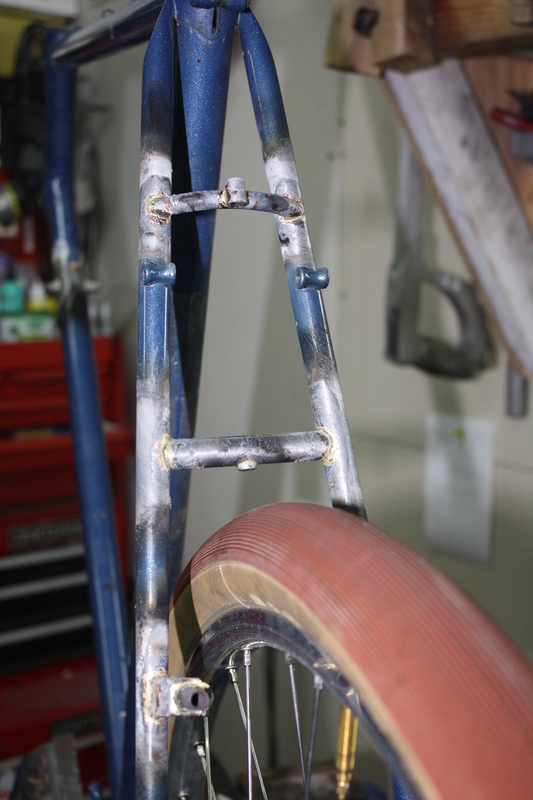 Then I made some deep indentations in the chainstays to increase tire clearance, and finally installed new bridges with fender mounts the correct distance from the tire. 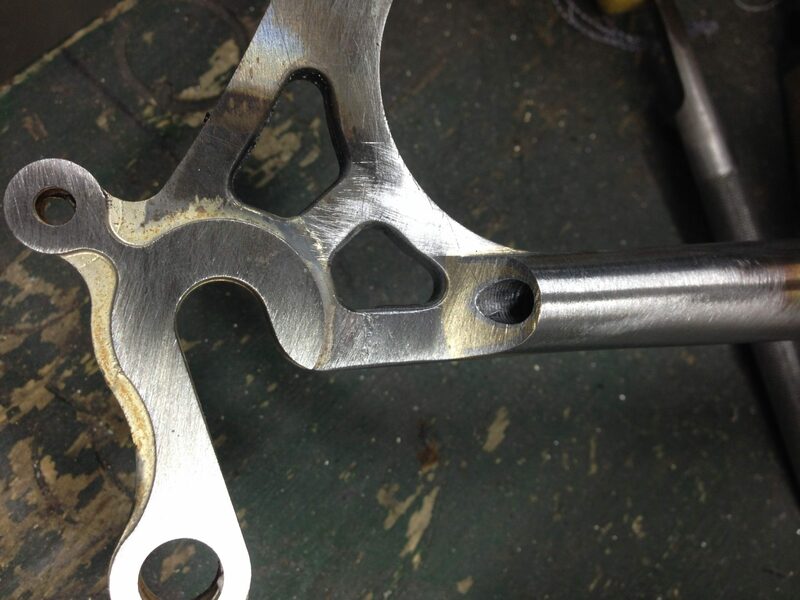 Here’s what the increased chainstay clearance looks like from below. 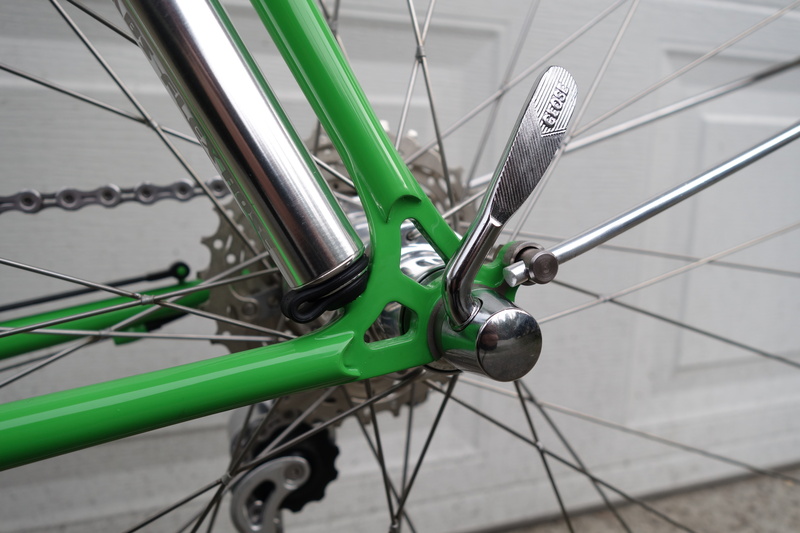 I also added brake bosses for cantilever brakes (more repurposed mountain bike parts), a rear brake cable stop, some shifter bosses, and a pump peg. 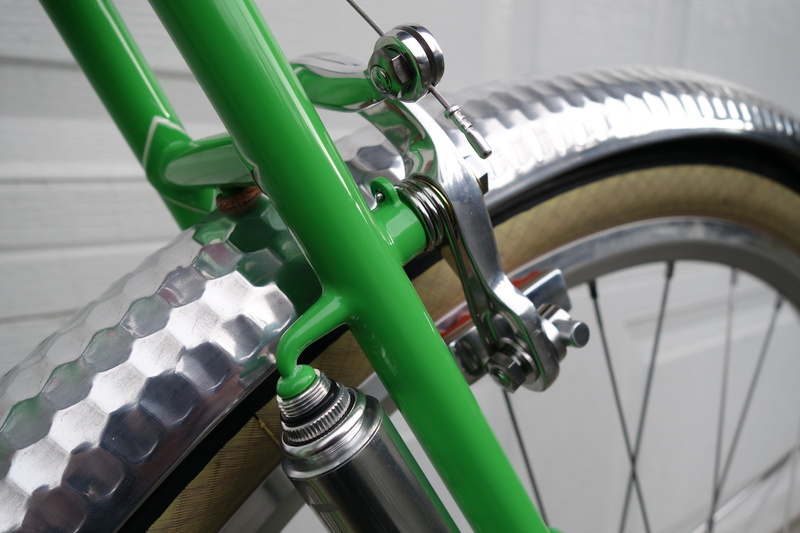 Brake bosses, cable stop, and seatstay bridge. 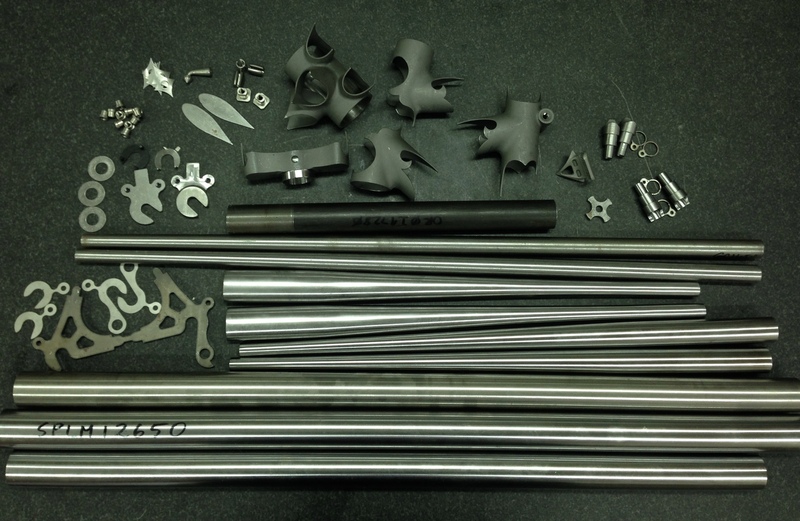 After an inexpensive black powdercoat, the bike was ready to reassemble. 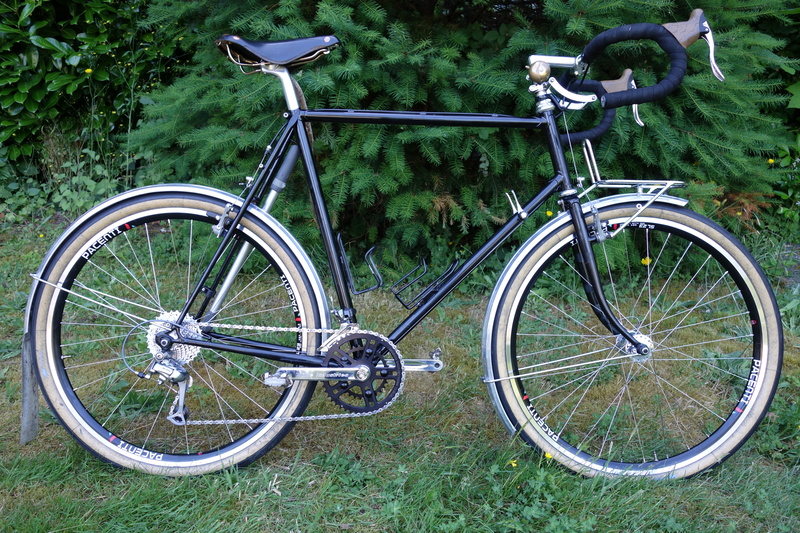 I built new wheels for it using the old Shimano mountain bike hub, and a Schmidt front. I think the wheels were the most expensive part of the whole project. Wheels and tires are no place to save money, but that’s a subject for another post! 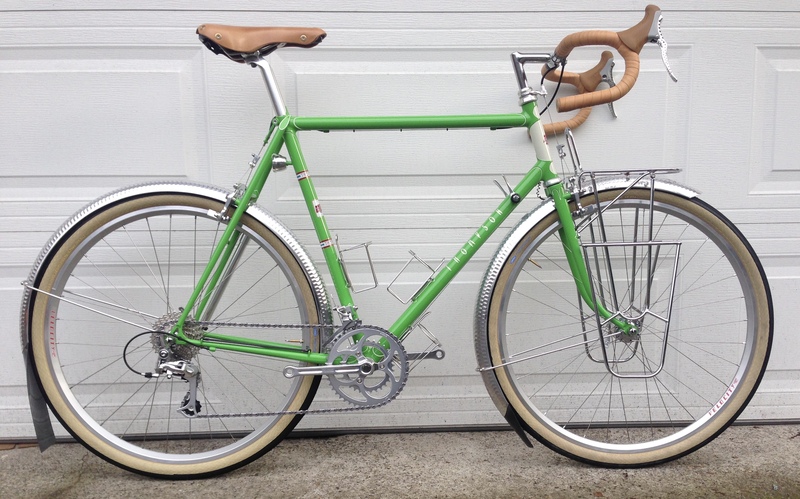 Fenders, a chain, handlebar tape, and a stem were the only other new parts purchased. 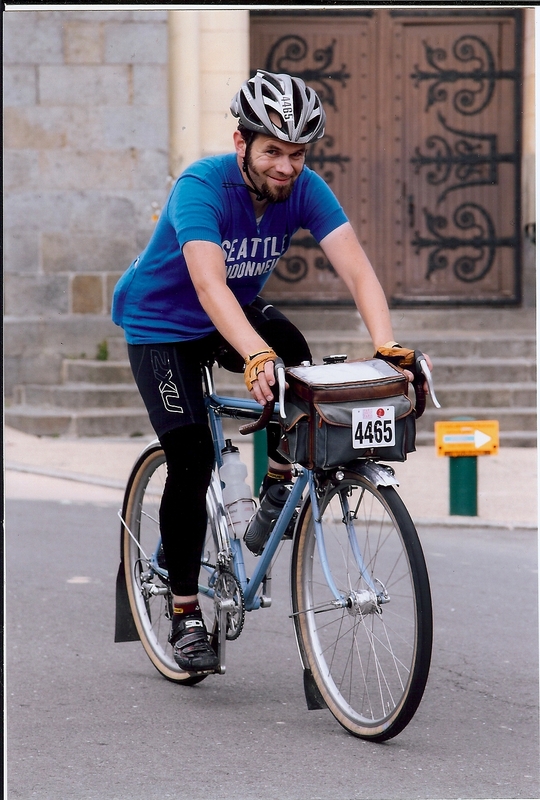 I never got a picture of the finished bike, but the customer loved it and rode it later that summer on his first 1000km brevet. A couple weeks ago the bike came back for some upgrades and some overdue routine maintenance. 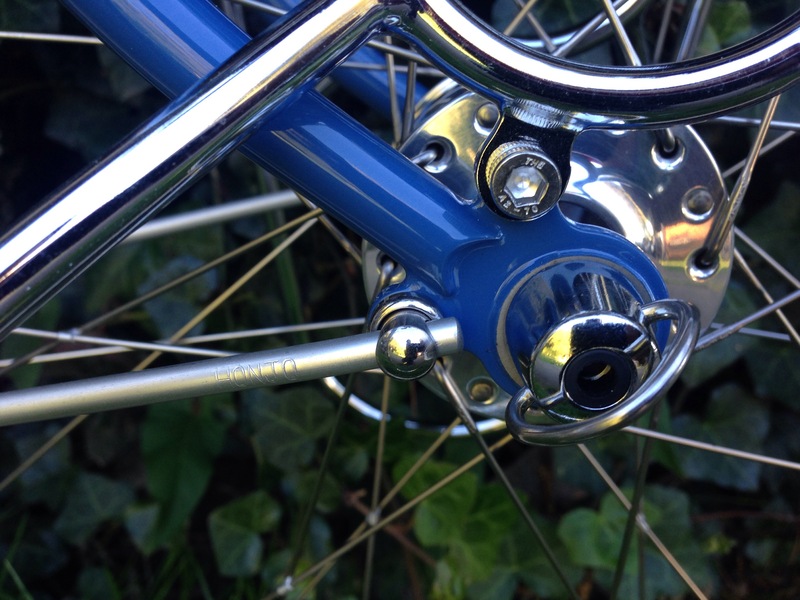 Long harsh winters had taken their toll on the braking surface of the lightweight rims, and the old seven speed drivetrain wasn’t doing well either so it was time for some upgrades: a ten speed freehub body and cassette, new shifters, derailleurs, crankset, and rims. While I was at it, I washed and waxed the frame. Maybe you have a similar old bike lurking in a dark corner of the basement or languishing in the attic. Could it be a conversion candidate? 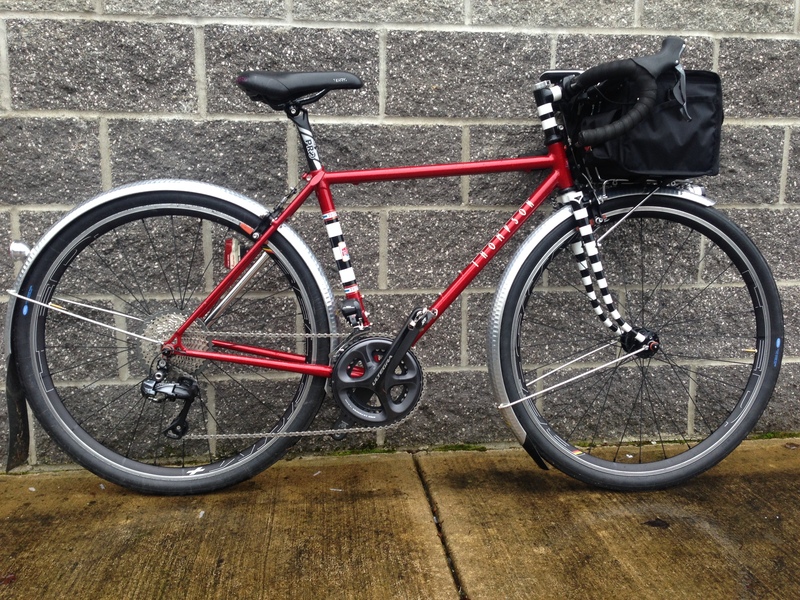 Finished product: a solid and dependable 650B randonneuring bike for a fraction of the cost of a custom.